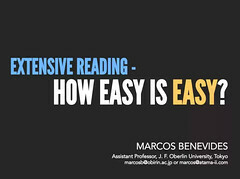 One of the major principles of extensive reading is that if a learner can comprehend material at 98% comprehension, she will acquire new words in context, in a painless, enjoyable way. But what is 98% comprehension? Humans are actually really bad at gauging this, partly because schools rarely teach this way. 98% comprehension means that only 1 in 50 words is unknown. But still, it’s hard to have a feeling for exactly what that’s like. In the morning, you start again. You shower, get dressed, and walk pocklent. You move slowly, half- awake. Then, suddenly, you stop. Something is different. The streets are fossit. Really fossit. There are no people. No cars. Nothing. “Where is dowargle?” you ask yourself. Suddenly, there is a loud quapen—a police car. It speeds by and almost hits you. It crashes into a store across the street! Then, another police car farfoofles. The police officer sees you. “Off the street!” he shouts. “Go home, lock your door!” “What? Why?” you shout back. But it’s too late. He is gone. I run into this number “80%” quite a lot in my work. Maybe it’s because of the 80/20 rule; I don’t know. But what I do know is that many learners think 80% comprehension in a conversation or in a business meeting is enough to follow. In reality, 80% is extremely frustrating because you can get so much of the conversation, but you’re still fairly clueless about a lot of the meat of the discussion. Generally speaking, you’ll know the topic, but fully understand virtually none of the details discussed. Pretty maddening. This isn’t actually bad news… It doesn’t change the numbers of hours of focused practice needed to become fluent in a language. In fact, it goes a long way toward explaining that intermediate plateau, as you slog from an average of 60% comprehension or so to closer to 90%. That’s why you’re learning so much but don’t feel the breakthrough. It’s also why it’s so important to have a good teacher, and materials at your level. Also, I’m working on a sample similar to Benevides’s, but for Chinese. It’s tricky for Chinese, because there are both words and characters to deal with. And then there’s the fact for the vast majority of English speakers in any audience, comprehension will be 0% no matter how carefully designed the sample text is. But I’ll do it anyway, using passages from Mandarin Companion books. any suggestions are welcome, of course! There’s an excellent video lecture from 2011 by Professor Alexander Arguelles that discusses the same principle. You can see it here and it’s well worth the watch. Great article! Love the examples, they really show that knowing 80% and 95% or more of a text makes a huge difference in our ability to read it. Like this 98% rule, interesting to think about how we could implement that in Ninchanese. What a clever way to demonstrate comprehension levels! I had been aspiring to an 80% comprehension level but now realise that would be a really frustrating place to stop after all my hard work! I find it really hard to estimate what percentage I understand at this stage – maybe 30% at best. However, I do think it’s also important to realise the difference between understanding basic, daily conversation and understanding more specialised (say in a particular field of work conversation). Someone told me it took them about a year of full time study to get to master daily conversation in Japanese but another year to master the Japanese he needed for work. I greatly flooped your beng example. Vilf Pareto meets Lewis Carroll on a brootle. Wow this was a really interesting read! I was wondering about one thing: The words used to demonstrate lack of understanding were actually “fake” words. But in reality, even if I encounter a word I don’t know, I might be able to guess its meaning because of some part of the word I know etc. Does that count as comprehension or not? About adapting it to Chinese: I would say it gets even more complicated here because sometimes you will be able to guess the meaning of a word if you know one of the composing characters. Sometimes you might have an idea about the meaning of the character because of the radicals used etc. Anyway, that was really interesting! Would be very interested to see what you spin out of this project!